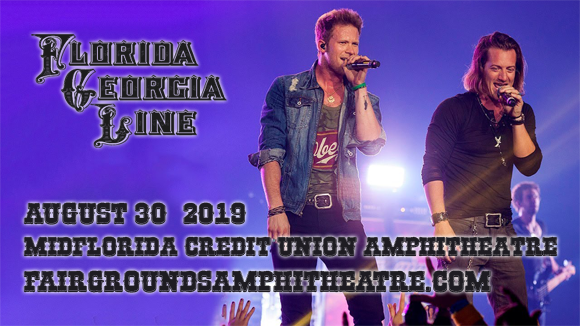 The unstoppable country freight train that is Florida Georgia Line comes to MidFlorida Credit Union Amphitheatre on Friday 30th August 2019! The boys are back on the road promoting their most recent smash hit album Can't Say I Ain't Country, and they're bringing it to you live in their biggest, most explosive show yet! Not only will the duo blow fans away with their spactacular headlining set, but they're bringing the incredible support line-up of Dan and Shay & Morgan Wallen! Trailblazers of the bro-country genre with their smash hit debut single "Cruise" (2012), Florida Georgia Line is the stage name of guitar and vocal duo Tyler Hubbard and Brian Kelley. The pair, who met at Belmont University in 2008, decided to embark on a music career upon graduation in 2010, giving themselves two years to make it in the business. The following year, they were signed to Nickelback producer Joey Moi's Big Loud Mountain Records label. "Cruise" was downloaded over seven million times and stayed at number one on the Billboard Hot Country Songs chart for 24 weeks, breaking two major sales records. They released their debut album, Here's to the Good Times, in December 2012 and the double-platinum-selling record became the sixth best-selling album of 2013 in the United States. Their most recent release is 2019's Can't Say I Ain't Country.